A master’s degree in public health is a must-have for anyone serious about a career in the field, and a pretty significant addition to the CV of many other professionals, including doctors, veterinarians, nurses, or government officials who operate in the highest echelons of the public health establishment. And like everyone else on that path, it sort of goes without saying that you want to get through that gate as quickly as possible. Maybe you’re already a working professional and the allure of the college hunt and application process has long since lost its luster. Maybe you’re just in a hurry to get out and put your public health skills to work in the real world. Whatever the case, you’re not interested in spending a lot of time spinning your wheels to get into an MPH program. Serving populations that need your help is where you want to spend your time, not checking boxes on some lengthy list of application requirements. And if that describes you, then you’re probably very interested in finding options that don’t have a lot of hoops to jump through or requirements to fulfill to get in the door. One of the most time-consuming of those requirements can be an entrance exam… usually the GRE (Graduate Record Exam) or MCAT (Medical College Admission Test) for MPH programs, but also, though less common, the GMAT (Graduate Management Admission Test) for MBA/MPH dual degree programs. These are comprehensive exams used to qualify prospective graduate students on the basis of verbal, quantitative, and analytical reasoning skills to provide standardized scores that schools use to cull the herd of applicants. This sounds important, and maybe even necessary, but as it turns out, entrance exam performance isn’t the predictor of student and professional potential it was once believed to be. Applying to schools that still use these somewhat antiquated vetting processes means you will have to find time to schedule and take the test before you can even submit your application. And since you had better not bomb it, you will also need to carve out enough time to study for that exam in order to get scores high enough to clear the hurdle… and that’s even before your application gets so much as a first glance. It’s a months-long process that stands between you and your degree… a process that more and more ambitious graduate students just like you are looking to skip so as to get right to the more important business of earning a degree and advancing a career. The good news is there is no shortage of MPH programs out there that are affordable, of the highest quality, and that don’t require entrance exams… and you’ll find the very best of the lot right here on this list. Of course, you have to ask yourself what kind of standards a school has if it doesn’t require an entrance exam. We know you don’t want to end up sitting in class with a bunch of mouth-breathers in some cut-rate school that can’t afford research facilities or decent faculty and staff. The simple fact is, there is no inextricable link between entrance exams and the quality of an institution, the rigor of the programs they offer, and the caliber of students they accept. There are many other things besides entrance exam scores that schools can consider when determining the readiness of a potential grad student; things that are arguably far more meaningful and far more effective in telling the story of where a student has been and where they’re heading. Would you rather study alongside a group of future colleagues that have years of professional experience, a history of volunteerism, meaningful contributions to research and literature, references from employers and previous professors, the ability to clearly articulate their drive and purpose in the field of public health…. Or students that achieved passing scores on an entrance exam? You’ll have a similar a-ha when you consider the most meaningful metrics for determining the quality of a program. By now you won’t be surprised to hear that none of them have anything to do with whether or not a school chooses to use entrance exams. Rest assured, we only considered CEPH accredited programs for this list. The Council for Higher Education Accreditation and the U.S. Department of Education both recognize the Council on Education for Public Health as a specialty accreditation agency for public health programs, and for good reason. CEPH has been establishing and assessing standards in advanced public health education since 1974. Backed by decades of institutional experience evaluating public health master’s programs from the inside out, CEPH has an intimate understanding of the leadership, policy and scientific competencies expected of public health professionals coming into the field today. That makes CEPH accreditation a key measure of quality, so much so that it is a requirement for determining eligibility to sit for the predominant professional certification in the field, the NBPHE’s Certified in Public Health exam. Every aspect of public health is evolving continuously, from the scientific understanding behind epidemiological controls to the software used for biostatistical analysis to the policy preferences for building large-scale population health initiatives. All those changes are driven by one thing: research, and lots of it. Every public health program worth its salt is actively engaged in research, something that always involves, and even relies on, the graduate students attending their programs. That’s why when making our selections we gave a lot of consideration to both past contributions to research, and the research actively taking place at these institutions. Research funding and the sources of that funding can tell you a lot too. If government and industry sees a strong record of meaningful contributions to research and exciting new developments in the works, you better believe they’re going to kick in hefty sums to advance this work. This is why we also gave a good long look at how much funding they receive to drive their programs, with special attention given to large grants and endowments that have come in recently to fund current research efforts. Many of the most significant contributions to research and literature that end up advancing the science of public health, the methods of disseminating new information, and the policy protocols that make it all possible are happening on university campuses. People can make a big name for themselves in the public health field through big discoveries or persistent, selfless effort. And a lot of those people are found teaching at top tier universities. At the end of the day, a program is only as good as the professors who teach it, so we gave special attention to identifying programs with all-star faculty members; the kind driving cutting-edge advances in the field. CEPH accreditation comes with a requirement that all MPH students undertake an Applied Practical Experience component as part of the program. While getting some field experience is a given in any CEPH-accredited program, the kinds of practicum placements or internship options a program has access to says a lot. Experiential learning options are, perhaps, the single best indicators of how well a school of public health is connected to both the local and broader global public health communities, and ultimately, how well an MPH program will prepare graduates for the field, both in terms of the value of the connections they make and the quality of the experience itself. Diverse internship appointments that give students a chance to work in government agencies, non-profits and private corporations provide a fuller picture of how the public health community gels and works together, while international experiences put students on the ground working to resolve the most pressing issues in emerging economies. The bottom line is that the nature and quality of the experience you’ll have access to might make all the difference in your career. Programs with options that align with different career paths and set students up in major agencies where they can network and actively take part in public health initiatives definitely got a second look as we considered the programs worth recommending. All of these factors come together to give you a first-rate education in public health, while sparing you all the extra time and effort of taking entrance exams that have nothing to do with public health in the first place! So here it is – the hand picked selections we feel confident calling the very best MPH programs in America. The school’s mission is to prepare students for a career in public health service, and a solid generalist education is the path they have taken to fulfilling that mission. But a complete slate of courses in the core competencies of public health are just the beginning of what you’ll get at the LSUS MPH program. The school’s partnership with LSUHSC offers another plus through that entity’s affiliation with five different regional medical centers, broadening the expertise and experience on offer to public health students. Research opportunities are also expanded through the partnership, opening up investigations into medical practice areas that would otherwise be out of reach. Electives in subjects such as GIS use in public health and strategic planning help you round out your education with a taste of some of the specialized aspects of the field you might later choose to pursue. SCU graduates end up working in local and state public health departments, hospitals, insurance companies, community agencies, and even major non-profit organizations like the American Red Cross. It’s an intensively hands-on preparation for a career in public service, with many class activities centering on community service in addition to the internship requirements. Students take the values of human rights, collaboration, and community involvement to heart here, with one recent project gaining media attention for mounting an awareness campaign about binge drinking on college campuses. You’ll get all the tools here you need to become a leader in the field of public health along with practical experience on the ground and the satisfaction that comes with doing real work in the real world. Folks forget sometimes that there is a lot more to New York than New York City. Although there are some fine programs in the urban core there, you can get a public health education with a more rural and small town focus at CNYMPH—the Central New York Master of Public Health program, run by SUNY’s highly respected Upstate Medical University. You can take advantage of a professional, expert faculty and the sort of interprofessional education that comes from studying public health in a primarily medical setting without giving up the solid foundational tenets of a CEPH-accredited public health degree… epidemiology, biostatistics, outreach, and other core principles are fully and soundly covered. Nor is the program entirely provincial; your field placements can be performed right there in Onandaga county, but other students have conducted their APE placements in exotic Costa Rica studying dengue fever outbreaks. Whether you have major goals in international agencies or plan to keep it close to the ground at home, CNYMPH hands you the education you need to accomplish them. Since Community Health Education is the only concentration on offer at SIU, it makes a lot of sense to look hard at the community the program primarily serves. In this case, the misfortune of that community, part of the severely disadvantaged Mississippi Delta area, provides students like you an opportunity to make a real difference in the realm of public health before you even graduate. You’ll study grant writing, public health administration, and communications through experiential projects that will serve both to train you while actively benefitting the underserved populations of the region. New York is buzzing with medical and healthcare research and activities, so studying to earn an MPH in the city already gives you a leg up for opportunities to network and practice your profession well before graduation. Choosing CUNY’s program for your studies not only gets you in the door fast with zero entrance exam requirements, but it puts you in the middle of many exciting research and experiential learning projects. A dedicated Office of Sponsored Programs and Research helps to coordinate external support to ensure steady funding for those investigations. And although learning in the city gives you plenty of opportunities to study specific communities in one of the great urban centers on the planet, the school’s vision for public health isn’t tied to the local area, the region, or even the U.S. You’ll learn public health with a global focus, anchored by the Center for Immigrant, Refugee, and Global Health, which takes advantage of New York’s unique multicultural characteristics and uses them as a springboard for explorations of other parts of the world. Center for Innovation in Mental Health turns the focus inward, looking into the highly personal aspects of mental healthcare in a partnership with ThriveNYC, an unprecedented public health project underway in the city. The University of Utah is strongly practice-focused, offering a generalist degree in public health that does not require any type of research project for graduation. Consequently, you’ll spend more of your time building the core foundations of your public health knowledge in biostatistics, epidemiology, strategy, and communications, and also in a required 270-hour hands-on practicum learning experience in the field. The program values knowledge sharing and implementation on both the local and global levels… the school is an active participant in global public health efforts in rural areas of Africa, China, and India, and faculty and students have gone to Armenia, Kenya, and Peru to participate in other projects in the past. The belief that education can help prevent the spread of disease isn’t just lip service here—the school puts it into practice daily, and you can be a part of it. With small class sizes and a relatively low tuition cost, you immediately get the sense that UNH is a pretty congenial place. While the professors bring loads of expertise and experience to the classroom, they can be partners as much as instructors, focused on health management and policy research with a decidedly regional angle. Student projects tend to focus on the New Hampshire or New England area, studying subjects such as the use of outdoor therapy in substance abuse treatment, or building public health libraries in small New England towns. But you’re not constrained to places where the leaves turn in the fall… other students were recently named as Gilman Scholars and will be studying on four different continents over the spring and summer of 2019. That’s the kind of range and flexibility you can expect to find at UNH. The school uses the Foundational Model for health science studies that ties together the natural and behavioral branches of study for a holistic experience in public health training. A broad slate of elective options, everything from public budgeting and finance to research methods in health disciplines, allow you to customize your degree plan to fit your personal career objectives. You’ll experience an innovative, skills and community-based approach to training here, with participatory research embedded throughout the curriculum. Partnerships with local non-profits, health care agencies, and corporations give you a shot at conducting research and performing real-world public service tasks in venues where the results really matter… all while earning credit toward your degree. Graduates from the EVMS MPH program often find when they enter the workforce that they have been better prepared and equipped by their course of study here than contemporaries who have attended more expensive and harder-to-enter programs. Part of that comes from attending a program at a medical school, where interdisciplinary research and interprofessional cooperation are baked into the curriculum. You’ll be exposed to insights and perspectives from other healthcare professionals that will broaden your own views and capabilities in the public health field. And the other part is simply the EVMUS value of prioritizing students and equipping them with the skills and values they need to undertake a lifelong pattern of learning. Put them together and you have got an affordable, easy-entry program that can go toe-to-toe with MPH options at even the priciest schools. APU got its start as an offshoot of the American Military University, which is probably where its practical, no-nonsense, flexible approach to public health education comes from. Faculty and staff understand that you have other things going on in your life and that you have the self-discipline and motivation to absorb the lessons they offer on your own time and in your own way. That gives you a lot of freedom, but also a lot of responsibility… you’ll be offered a curriculum and hands-on experiential learning opportunities that are among the best in the country, but it’s on you to take full advantage of this program. With unique course offerings in emergency management that most generalist degrees don’t have, you can build a critical base of skills and knowledge in that area even without a dedicated concentration. Touro has a highly respected set of public health programs that strike a balance between local community and global health concerns. That’s reflected in the two current concentrations on offer, which can take you in either direction with specialized training and applied research opportunities down the block or around the world. The school plans to add a third concentration, in health equity and criminal justice, based on a grant from the TUC Intramural Research Awards Program and in coordination with Oakland-based non-profit organization Exonerated Nation, which studies and meets the immediate need of exonerated individuals who face unique challenges reintegrating into society. It’s the kind of forward-thinking and niche application that you can expect at Touro, backed by comprehensive research programs and external collaborations funded by multiple NIH grants. You can have faith in the ability of CBU to prepare you for a research-backed, practice-focused career in the public health service with a rigorous, experiential education in the core precepts of the field. The Department of Public Health Sciences is a vibrant one on campus with many active student organizations and a motivated, engaged faculty of experts with years of experience in both academia and public health practice. Internships and global missions feature prominently in the kind of hands-on experience that the university encourages, together with active participation in the many research projects underway. The school is dedicated to preparing you for immediate employment with a comprehensive base in the five core areas of public health knowledge. Although it’s a generalist program, La Salle offers some fairly niche elective classes such as Urban Men’s Health, Violence Prevention & Control, and Reproductive Health for Public Health Practitioners. Together with the cross-cutting competency courses in GIS Applications and Grant Writing, you’ll get not only a strong core in the 5 major public health disciplines, but a fully effective and practical exposure to the realities of public health practice. A capstone thesis requirement will reinforce the proficiencies gained through the course of the program by providing a meaningful and scholarly exercise based on your personal academic interests and ultimate career goals. Specialization in public health master’s programs is never a bad thing, and CDU pulls out all the stops with their focus on urban public health in an MPH dedicated to examining and correcting the many disparities in that field of practice. With courses covering the gamut from environmental determinants of health to race and cultural competency, you’ll get an education in the underlying basis of those disparities. Then, with more classes in health communication and data visualization and community engagement in public health, you’ll be equipped with the tools you need to start fixing the problems… at both the street and policy levels. The curriculum is developed around the tenets of diversity and inclusion, and the mentoring and instruction in this cohort-based program puts you face to face with expert instructors and fellow students who will become part of your professional network for your entire career. MCPHS offers a top-down, strategy-driven perspective on public health issues. It’s a generalist degree that lets you take in the big picture of both the public health field overall and individual problems within it. You get the context that allows you to bring together your courses in community health assessment, health promotion, program design and other fundamental disciplines so you can approach issues with innovative, interdisciplinary solutions at your fingertips. The program offers great flexibility through an online option that places you in a virtual team, consuming course materials asynchronously and coordinating through sophisticated learning management portals. It’s terrific preparation for the kind of cross-functional teamwork you’ll need to foster in your career, and a preview of the sort of multi-tasking you’ll need to master to be a successful public health practitioner. The learning environment at Jackson State is expressly designed to support interdisciplinary communication and professionalism in order to produce graduates primed to become outstanding leaders and practitioners in public health. Jackson is a leader when it comes to creating and promoting real solutions to the issue of minority community health disparities. Research and outreach conducted through the Center of Excellence in Minority Health and Health Disparities is a key component of graduate education at the school. The scope of the program is global, but the focus is on underserved and at-risk populations in Mississippi. Your training will come with a heavy helping of mentoring, advocacy, and technical resources to aid you in achieving that goal. While University of Connecticut encourages applicants to take the GMAT, GRE, MCAT or other similar exams, the admissions department does not make entrance exams a hard requirement. 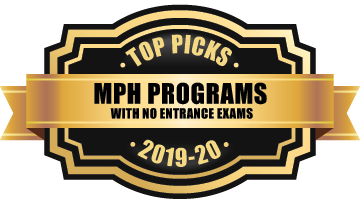 And given UConn’s reputation for excellence and all the stand out things about the MPH program here, that was all we needed to hear to make sure we were able to include this exceptional program on our top picks list. UConn delivers a population-centric, evidence-based generalist MPH degree on flexible terms that allow you to complete your study in two years full-time or four years part-time. The broad base of foundational knowledge you’ll receive in health administration, law, epidemiology, and research methods will be supplemented by electives that dive further into each of those areas or branch out into the social sciences, environment, or quantitative studies. You’ll learn each of these subjects from faculty who are in-demand as consultants and researchers throughout the public health community, giving them a valuable real-world perspective to pass along to you in class. Their research efforts, as befits a university with a generalist MPH degree, span the spectrum of current public health concerns, from public policy to addiction intervention to chronic pain and cardiovascular disease. You’ll find a multi-disciplinary program at West Chester that focuses on problem-solving, research, and professional development in the realm of public health. With a practical set of concentrations on offer, it’s a good fit for students looking for career-oriented, hands-on training in some of the most in-demand areas of public health today. With 300 hours of real-world experience offered through the Applied Learning Experience internship, you have plenty of opportunities to connect classwork to the reality of day-to-day public health work in a wide variety of experiential settings. Whether it’s in the gritty environmental aspects facing public health professionals or the political and policy aspects facing health care management teams, you’ll find a comprehensive education tied to practical experience at West Chester.